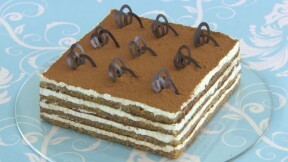 This tiramisu cake recipe is featured as the technical challenge in the Desserts episode of The Great British Baking Show. Preheat the oven to 180C/160C(fan)/350F/Gas 4. Grease a 35x25cm/14x10in Swiss roll tin and line with baking parchment. For the sponge, place the eggs and sugar in a large bowl and, using an electric hand-held mixer, whisk together for about five minutes, or until the mixture is very pale and thick. The mixture should leave a light trail on the surface when the whisk is lifted. Sift over the flour and fold in gently using a metal spoon or spatula, taking care not to over mix. Pour the mixture into the prepared cake tin and tilt the tin to level the surface. Bake for 20 minutes, or until risen, golden-brown and springy to the touch. Cool in the tin for five minutes then turn out onto a wire rack and leave to cool completely. For the filling, dissolve the coffee in the boiling water and add the brandy. Set aside to cool. When the sponge is cold, carefully slice the cake in half horizontally, so you have two thin sponges of equal depth. Using the loose base of a square cake tin as a guide, cut two 18cm (7 in) squares from each sponge. Discard the sponge trimmings (or keep for cake pops or a sneaky single-serving trifle). Line the base and sides of the square tin with long rectangles of baking parchment; there should be plenty of excess parchment which you can use to help lift the cake from the tin later. Place the mascarpone cheese in a large bowl and beat until smooth. Gradually beat in the cream and icing sugar to make a creamy, spreadable frosting. Place one layer of sponge in the base of the lined cake tin. Spoon over one-quarter of the coffee brandy mixture. Then spread one-quarter of the mascarpone frosting over the soaked sponge. Scatter over one-third of the grated chocolate. Place the second sponge on top, spoon over another quarter of the coffee mixture then spread another quarter of the frosting over the soaked sponge. Scatter over another one third of the grated chocolate. Repeat with the third sponge and another one-quarter of the coffee mixture and frosting and the remaining grated chocolate. Place the fourth sponge on top and spoon over the remaining coffee mixture. Using a palette knife spread a very thin layer of the remaining frosting over the top of the cake – this is called a ‘crumb coat’ and will seal in any loose crumbs of sponge. Wipe the palette knife and spread the rest of the frosting in a thicker layer over the cake. Chill for at least one hour in the fridge before turning out. While the cake is chilling, melt half of the chopped chocolate in a small bowl set over a pan of gently simmering water. (Do not let the bottom of the bowl touch the water.) Gently stir the chocolate until it reaches a melting temperature of 53C (127 F). Remove the bowl from the heat and add the remaining half of chopped chocolate and continuing stirring gently until the chocolate cools to 31C (88 F) or lower and is thick enough to pipe. Place a sheet of baking parchment on the work surface. Use another sheet to make a paper piping bag. Spoon the melted chocolate into the paper piping bag. Snip off the end and pipe decorative shapes onto the baking parchment. Leave to set until required. Dust the chilled tiramisu cake with the cocoa powder before turning out onto a serving plate, using the parchment paper to help lift out of the tin. Decorate with the chocolate shapes.